The good news is that the Diamond Fantasy Scarf is blocking. This was my KR New Beginnings project: the pattern by Sivia Harding was easy to follow (instructions were in written and chart form) and the scarf was the perfect size so that I would not get impatient with the increasingly long rows. Edited to add: false alarm. Once the shawl and sheet were dry, it became apparent that the orange spots were figments of my imagination, the dye did not run and all is fine and well. 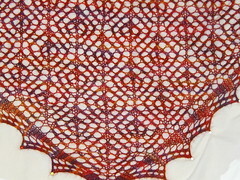 Here's a closeup of the diamond repeat. 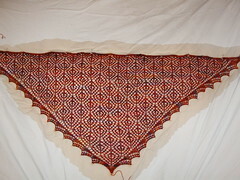 I love this "sangria" colorway by Handmaiden: orange, red, and purple. My January socks are "Hydrangea" socks. The pattern is from Sundara's Petals Collection but I did not belong to the sock club back then so I am using another colorway of Sundara sock yarn, a lovely variegation of purple called "Blueberry smoothie". i love that scarf, it is just gorgeous! is it made of handmaiden cashmere? the socks look like they will be a lot of fun too... what a pretty color! The scarf is beautiful! Lovely colour, but pity about it staining the sheet.